The objective of the 2nd International Conference on Green Communications and Networks 2012 (GCN 2012) is to facilitate an exchange of information on best practices for the latest research advances in the area of communications, networks and intelligence applications. These mainly involve computer science and engineering, informatics, communications and control, electrical engineering, information computing, and business intelligence and management. 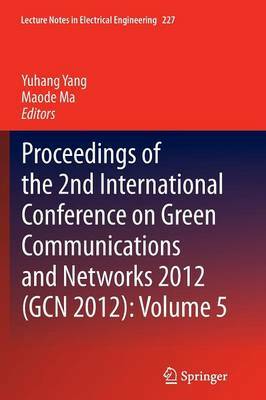 Proceedings of the 2nd International Conference on Green Communications and Networks 2012 (GCN 2012) will focus on green information technology and applications, which will provide in-depth insights for engineers and scientists in academia, industry, and government. The book addresses the most innovative research developments including technical challenges, social and economic issues, and presents and discusses the authors' ideas, experiences, findings, and current projects on all aspects of advanced green information technology and applications. Yuhang Yang is a professor at the Department of Electronic Engineering, Shanghai Jiao Tong University. Maode Ma is an associate professor at the School of Electrical & Electronic Engineering, Nanyang Technological University.